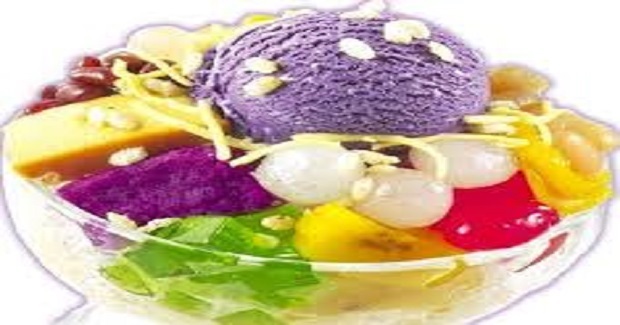 Halo-Halo Dessert Or Mixed Fruits In Shaved Ice Recipe - Gutom Na! Posted on Tuesday, April 26th, 2016 at 5:30 pm. Place about 1 tablespoon each of the first 6 ingredients into 4 tall glasses. If desired, add a teaspoon of white sugar per glass. Add half cup of shaved ice to each glass. Add 1/4 cup of evaporated milk to each glass. Top with 1 tablespoon of purple yam jam and caramel custard. If you want to make it special halo-halo, add a scoop of ice cream.